Set the Halloween mood with this advanced Lightshow projector. Stake it in the ground or set it on a table to project a brilliant light effect onto any wall or flat surface. The realistic thunder sounds sync with each lightning strike. Delight in bone chilling thrills when you illuminate the pathway to your home with the Set of 4 Grim Reaper Pathway Markers. With glowing red eyes and scary sounds, these gruesome guys are ready to take a bite of anyone that passes by. No need to chomp on the heels of your neighbors, these creepy Grim Reapers are sure to shine a scary light on any Halloween display. White LED Thunderbolt Projector Set the Halloween mood with this advanced Lightshow projector. Stake it in the ground or set it on a table to project a brilliant light effect onto any wall or flat surface. The realistic thunder sounds sync with each lightning strike. White LED Thunderbolt Projector is rated 4.1 out of 5 by 79. 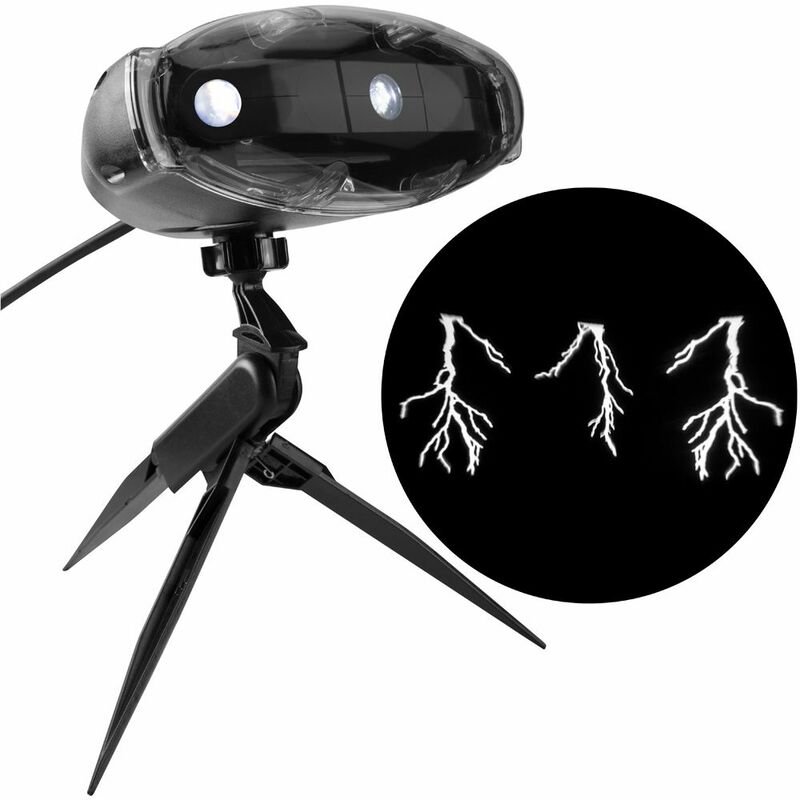 Rated 5 out of 5 by GreatpropforHalloween from Great price, has sound and thunderbolt flashes. Easy to... Great price, has sound and thunderbolt flashes. Easy to set up, I love the three prong stand. Rated 5 out of 5 by Miro from The thunder bolt with sound projector is really nice and works great! The kids love it and this w... The thunder bolt with sound projector is really nice and works great! The kids love it and this will be a great addition to my Halloween decoration. Rated 4 out of 5 by BeltranElectric from We hooked it up to a motion sensor and it... We hooked it up to a motion sensor and it was a hit! Rated 5 out of 5 by myskye23 from GREAT display for Halloween. The lights were bright and the thunder sounds were much louder than... GREAT display for Halloween. The lights were bright and the thunder sounds were much louder than I anticipated. The kids loved it when they came to the door. Highly recommended.